Why Use Natural Wood Perches? If you don’t have the time, tools or access to safe woods to make all of your own bird perches all of the time, or you just want something a bit different, buying natural pre-made wood perches is a quick and cost effective way to add some variety to your parrot’s cage or aviary; or just placed around the house in convenient spots for when your birds are having some supervised free flight time. This guide presents some of the best ready-to-use wooden bird perches that you can provide to your parrots for their comfort, health and fun! Natural perches are the best and only way to keep the feet of captive parrots healthy and comfortable. In the wild birds stand on thousands of different surfaces every day. We can’t replicate this in captivity, but providing as many different perching surfaces, textures, sizes and shapes means that birds won’t suffer from debilitating foot conditions that come about as a result of unnatural, uniform and inappropriate perching such as smooth dowel perches, plastic, and any other unnatural perches. 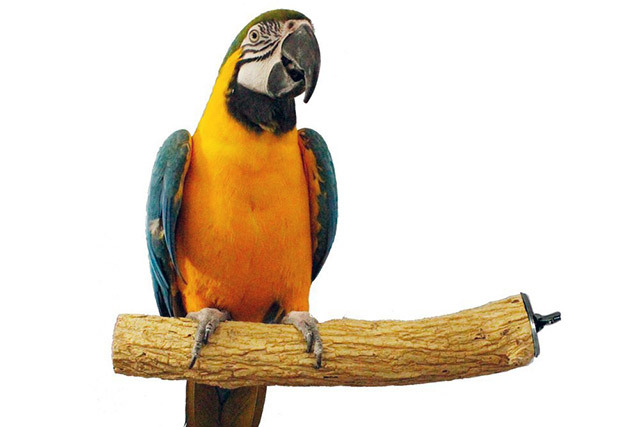 Real wooden perches help to keep the claws of parrots trimmed, as well as provide vital variablity in the way their feet grip and walk on the perch; using the foot muscles in a wide variety of ways and not just one or two different positions. This is so important for the health and comfort of a parrot’s feet! Listed here are only trusted products that make available information on the type of wood used and/or the manufactering process and country of origin. This is to ensure that only safe, quality products are listed here as there are many other wood perches and wooden bird products in general out there which provide no details of the origin or types of wood used or what processes they’ve been through. Unfortunately some of these also have some questionable reviews posted online, from people who have received free or discounted items in exchange for a positive review. These have been filtered out as not only are the products themselves highly questionable, but so are the ethics of the companies behind them. Many of these are Chinese imports which need to be considered with the greatest of caution. 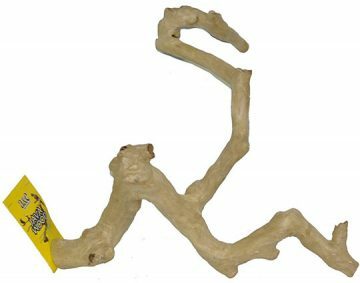 Coming from the grapevine tree, the shape of this perch is highly variable and uneven, making it excellent for foot exercise. The wood is taken from grapevine plants that have not been sprayed with chemicals. Additionally, the wood has been heat treated and sand blasted before being made into perches. Because these branches are taken from a vine, they have even more variability in shape, thickness and surface texture than those from most other trees. That just means when you buy one, you’ll receive a completely uniquely shaped perch. People have noted that birds of all sizes enjoy this perch: from Cockatiels to African Greys to Cockatoos. The Grapevine perch from Mac’s is a very unique perch in its shape and certainly makes an interesting addition to any parrot’s home. Wood from the cholla cactus are the stems and branches of the tree which have died. 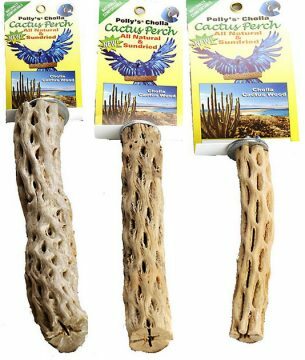 The cholla wood used for these Polly perches has been sun dried so all the natural holes and crevices that this type of wood is recognized for have been completely dried out. Every piece of cholla will be different so your perch won’t look exactly like that in the product photos as far as exact shape and width goes, but the company has created three sizes which cover the suitability for all birds (and even the smallest birds can certainly enjoy much larger perches to stretch their feet on). There are some lookalike perches out there, by the same company, which have been designed to look like cholla cactus but are artificial and similar to other mineral perches. These perches are colorful and have a sand coating on them. People wanting real natural cholla wood perches need to be looking at the ones linked to from this guide. These perches are listed as being from the dragon wood tree species. Exactly which dragonwood species is unknown, as there are a few different trees with this common name. The Polly’s hardwood perches come in 4 sizes: extra small, small, large and extra large. As you can see from the examples, the larger sizes are of an excellent width. 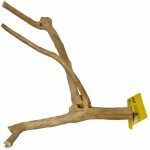 These are one of the thickest wood perches available and are excellent for larger parrots, as well as for smaller species who will be able to stretch their feet right out on the thick branches. These are one of the rougher barked perches, providing two benefits: comfy and healthy for the feet, and fun to chew on. Most parrots will enjoy slowly picking off the outer bark layer. The underlying hardwood ensures that the perch remains sturdy. In addition to these regular style perches, Polly’s also makes what they call full length hardwood perches. These extra long perches have attachments at both ends and are designed to fit the full width of some cages. The full length perches come in a big range of sizes to cover lots of different cages lengths: from 12 inches up to 36 inches in length and everything in between. This interesting looking perch is made by the small company Parrot Wizard. The hardware is stainless steel and the wood is Douglas fir, which is a great wood for parrots. This perch is unique to virtually every other natural wood perch on the market because they’ve taken a piece of Douglas fir, then machined it to create more bumps and textures throughout teh length of the perch. This means no matter where the bird is standing on the perch, the surface will always be variable and unique – great for parrot foot health. A lot of work seems to go into creating each Nu Perch, making this a high quality product. The manufacturer also guarantees no manufacturing defects and a lifetime guarantee (including no rust) on the stainless steel hardware for the life of the perch. Douglas fir is a moderately hard wood so the perch can be expected to last a relatively long time for all but the most obsessive big beaked wood destroyers. Bottlebrush (which is the common name for trees and shrubs in the genus Callistemon, native to Australia), is one of the best wood types for natural perching! It’s rough bark texture and hard wood make it ideal for every species of parrot. Most birds will eventually strip the outer bark away (a fun activity), but the hardwood underneath is tough even for the strongest beaked parrots. That means these perches last a long time. This premade bottlebrush wood perch is described by the manufacturer as being a “native Florida wood”. However there are no bottlebrush/callestimons native to the USA. This is an Australian wood grown in the US in plantations and gardens as it’s a beautiful tree when in flower. Compared to many other wood perches including the ones listed in this guide, this Bottlebrush perch has a rougher texture for parrot feet. With four sizes to choose from, the bottlebrush perches range from very thin up to much thicker pieces. As with all natural wood perches, the exact width and shape will vary a little, but these perches are mostly relatively straight compared with some of the other wood perches available (this makes it easy to place them in cages etc). Some people have spoken of receiving a perch with a Y shaped or multi-branched shape. Each piece is unique! 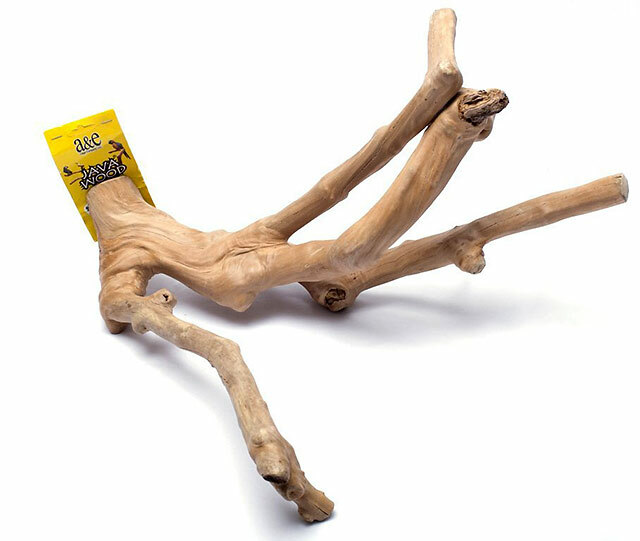 Manzanita is a popular natural safe wood to use for parrot perches in the US. This is another branched perch, so each individual one will be different to the next. Some of them are a really unique shape. If you’re after a perch that’s more uniform or predictable in shape, this won’t be the one for you. But if you have the cage room for a branched perch it can certainly add interest to the bird’s environment. This is a much thinner wood than that of the Java wood branch perch so may not last as long for most birds; but this is reflected in the low price. 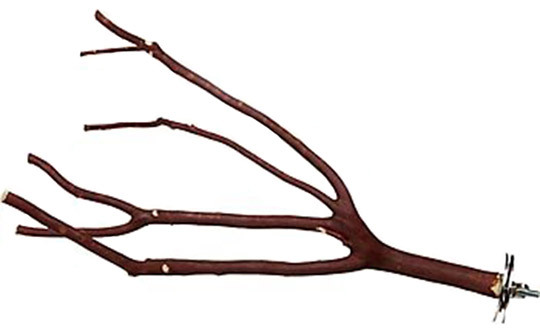 MOst people will buy multiple manzanita perches because they’re so low cost. Petco has two different natural wood perches. One is simply described as “hardwood”, while the other is described as Fir. No further details are available as to what type of fir wood (possibly Douglas fir or another species of true Fir), and what hardwood is used for the second perch. These products were still included in this guide based on the good reputation of Petco and the fact that if these were not suitable wood types, they would have been called out on it long ago. These perches have all the hallmarks of a quality product and have received positive reviews and comments across the board from customers. The Hardwood perch has a smoother surface to the Fir one, but both provide the benefits of natural wood. 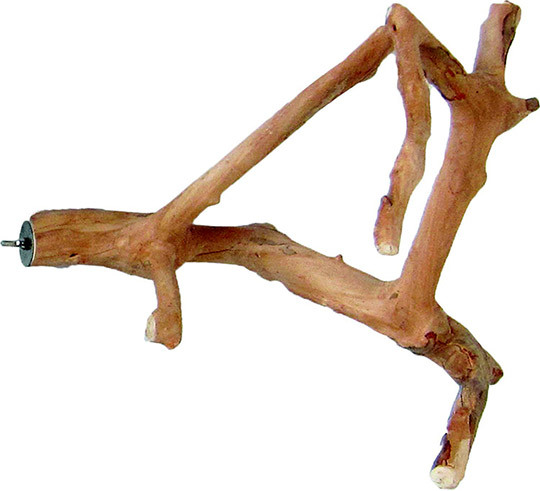 The Petco Hardwood perch is avaialble in small and medium sizes, while the Fir perch comes in a 10″ length. These Petco wood perches are more suited to small and medium sized parrots as they are quite thin when compared to some of the other wood perches available. The wood is taken from plantation non-fruit bearing Javan coffee trees (of the Coffea genus) in Indonesia. It’s only the leaves and fruit (the coffee beans) of these trees which contain caffeine; not the wood. This is a very hard wood so is made to last, even for the bigger beaks. Even the small size of this multi branch perch is larger and heavier than you might expect, and they will take up cage space. Many people choose to use them outside the cage, or attach them to a stand. But if you’ve got a massive cage for your parrots (as all parrots should), or an aviary, the size and solid build of this perch will be welcomed by birds. Any possible downside to this particular type of wood as a perch is that it’s naturally quite smooth, and does not have a rough bark texture like some other woods. The key is to use it as one of many variable types of perches of different textures and diameters. 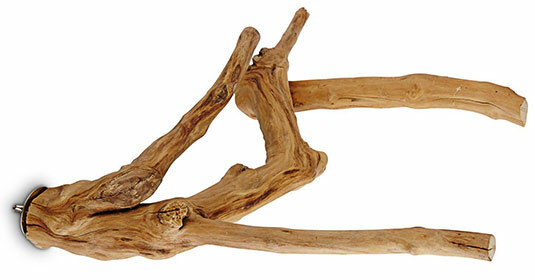 Because these are natural tree parts, every perch will be unique in shape and size from that shown in the picture. There are four sizes to pick from and people have bought this perch for every bird species ranging from little finches up to the largest Macaws and Cockatoos. A&E Cage Co. makes some of the best natural java perches that are all ready to be attached to a cage. Every single Java wood perch is unique and different as they’re straight from the tree (untreated, and completely non-toxic). The general sizes available are from X-Small up to Large and naturally, the exact size will differ between perches and how many branches there are, but the size guides are intended to give you a general idea of how much space the perch will take up in a cage or aviary. Remember – smaller parrots will also enjoy the much larger perches which allow them to stretch out their feet, so the extra small sized perches need not be the only option for little birds! Every species of parrot, from Budgies, to Conures, Amazons, African Greys, Cockatoos and Macaws and all in between, can benefit and enjoy this type of wood perch. You can check out these perches at Amazon and view the pricing of the different sizes.